Lots of Gatos and friends of Gatos. Enjoy your run! Perfect November weather, actually a little on the hot side. 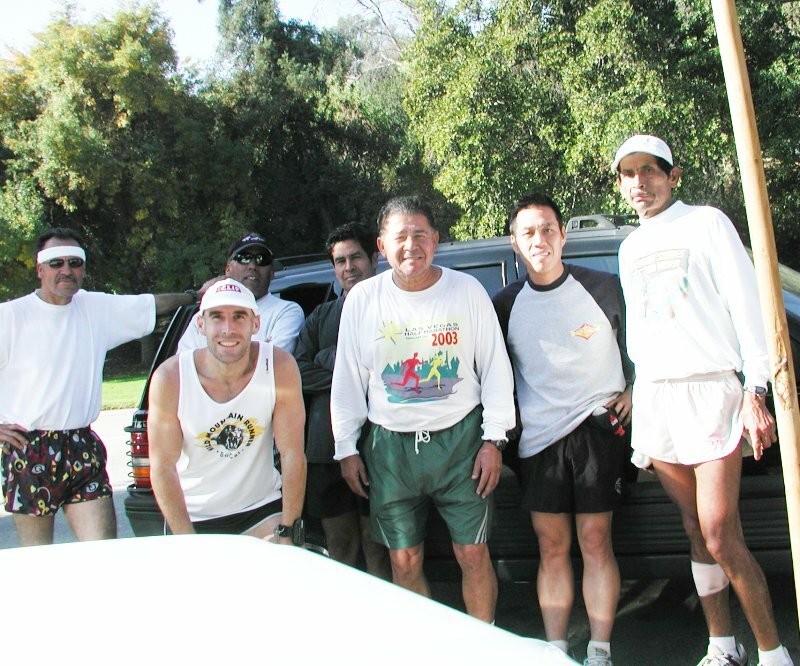 Most of the San Fernando Gatos did the Lake run 14+ miles. Chris Q and I (Barefoot Ted) did a couple 10 mile loops with Guillermo and Flaco. 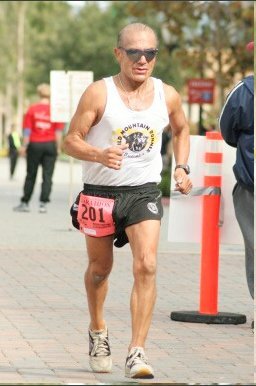 Guillermo Medina came in 1st place this year at the Angeles Crest 100 Miler. He did it in 19:33. 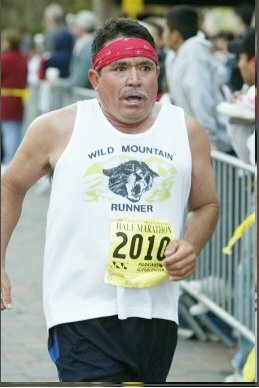 During this year's AC 100, I remember seeing both Guillermo and Flaco arrive at the 81 mile aid station still looking fresh. Truly great trail runners. Had a chance to hear about some of their training techniques. All very useful information hopefully leading to a successful completion of the AC 100 next year. Come on 100 mile Gatos! 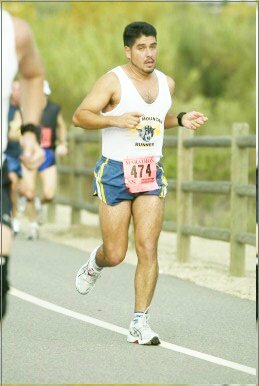 Let's do AC 100 in 2006! Beautiful day for a run. The course we ran today included crossing a dry river and running in very rocky, sandy terrain. Griffith Park Master Plan: "From Wild to Caged"
Griffith "Parque" has been the home of the Wild Mountain Runners for the past twenty four years. It is a place where accomplished athletes have trained even before the WMR adopted the parque. It is a place where we can always find a fellow runner to inspire us to try harder whether we are beginning, coming back, or running Kadafi's Trail back to back thirty times in a row. As you might have heard, the City of Los Angeles created a Master Plan for redevelopment of Griffith Park, It took a couple of years and a hefty sum of tax payers cash to create this 190 plus page document in which the work runner is not mentioned a single time. The plan includes parking lots, aerial trams, restaurants, hotels and a host of usual city clutter. But due to the opposition of a number of community individuals and community organizations, including ancestors of Colonel Griffith, a task force was created to revise the plan to make it more inclusive. Our editor in chief (Gilbert) and your truly attended one of the task force meetings where the discussion ranged from revising the Master Plan page by page to throwing the plan in the trash and starting all over again. One major change that was discussed was changing the theme of the plan from the park becoming a "living laboratory" to becoming an "urban wilderness". This theme change is important because it will keep the park generally in its present condition by maintaining its bucolic nature. Due to the massive amount of time and resources invested (meaning moola) by the city, the group chose to go with the page by page revision. Since these meetings are open to the public, at the end of each meeting there is time for public comment. At the last meeting held September 12th, I felt compelled to put in my two cents. I spoke about the need to preserve the park from the point of view that reflected the LA runners and the running generations to come. Those in the meeting appreciated the views that I presented. Gilbert and I are committed to attend more of the meetings on behalf of our club. We want to make sure that our home is preserved but there is a need to everyone to get involved by signing petitions, attending meetings because there is power in numbers. If we don't get serious and involved, the logo lettering in our next uniform may have to be changed from Wild Mountain Runner to Caged Cat! Once again Chris Quezada has come through for the club. 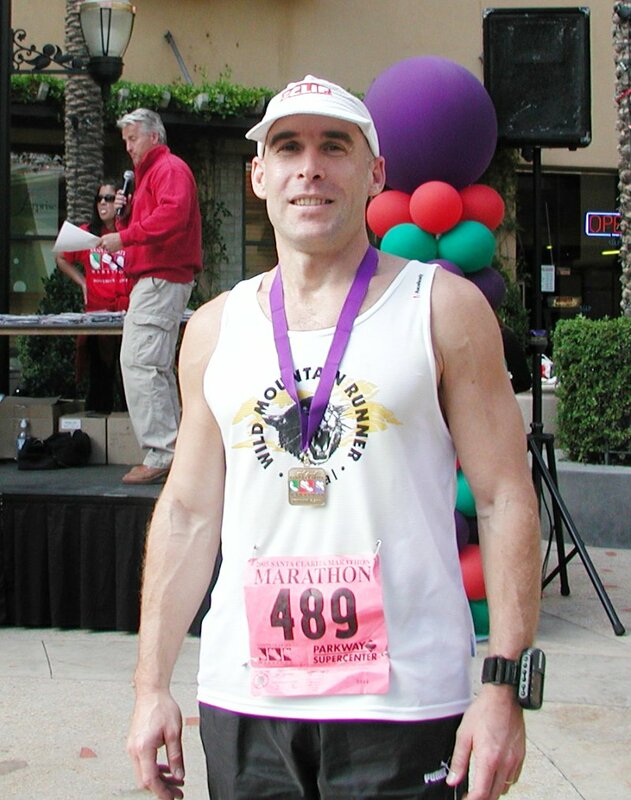 On Saturday, November 5, the day before the Santa Clarita � and full marathon, Chris delivered to the Griffith Part, South Gate and San Fernando WMR chapters the long awaited singlets and shorts. On Sunday, many of the WMR were sporting a new WMR look. The logo is essentially the same but now the club name wraps around the mountain lion's head and "SoCal" has been added to the logo. Both the singlet and the shorts are of better quality comparing to the old uniform. Great job Chris!! 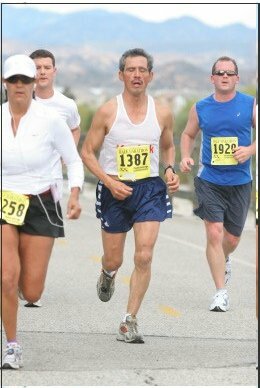 The 2005 Santa Clarita marathon and half marathon seemed to have brought the most runners ever since the event's inception. 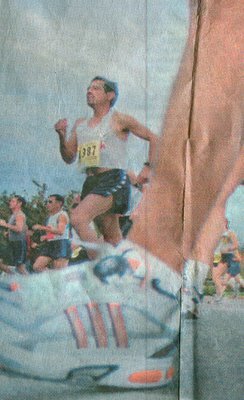 It was a wonderful moderately cold morning with overhead clouds present when the gun went off at 7 a.m. By 8 a.m., the weather began to gradually warm giving the Gatos a reason to hurry and complete the half marathon. By 8:30 a.m., four Gatos flashed through the finish line. Rafa Ramos was the first Gato and first runner overall to cross the finish. He finished far ahead of the second place runner with a time of 1 hour and 14 minutes. It was a proud moment for the Rafa and the Gatos to see our cat logo win half. Congratulations Rafa. 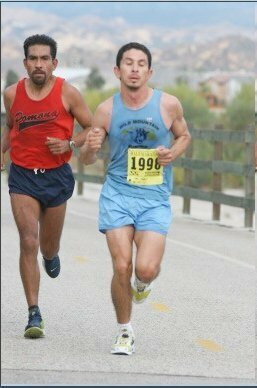 He was followed by San Fernando Gatos, Rogelio Lopez (1:20:31 3rd Overall), Ruben Gomez (1:23:23 7th Overall, 2nd in Division), Hector Soria (1:25:27 11th Overall, 1st in Division). Then came Fernando Mejia with a 1:26:37. Just beating the 1:30 time was Jose Rodriguez 1:29:06 and Roberto "Kadafi" Perez with a best this year of 1:29:07. 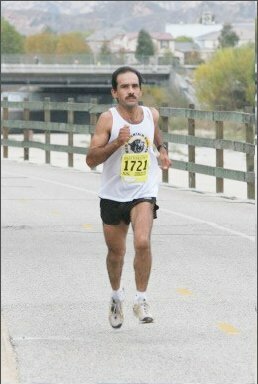 Julio Jaramillo, who just ran the Long Beach Marathon three weeks ago and once again qualifying for Boston, crossed the line with a 1:32:06. Too-busy-to-train-lately, Mario Sanchez 1:34:05. Sergio Lopez, a Belmont High School running star in the 1980's came in with a 1:36:10. With consistent and disciplined training Sergio should be in the low 1:20's. Chopping away at the ground with his motor like pace was Benjamin "Chaparron" Palomares tore through the finish with a 1:40:52. David "El Huero", whose height gave great presence to the singlet's logo, came in with a 1:43:28. 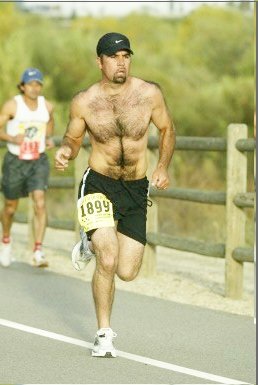 Then running in with his shirt in his hand was bare-chested Ricardo Menjivar with a 1:48. 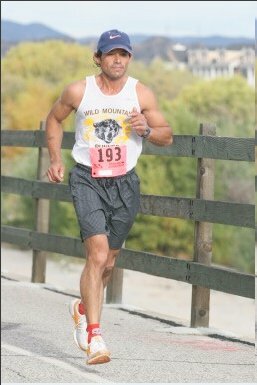 Gonzalo Burgos, who trains at Griffith Park whether rain or shine, came in with a 1:50:14. 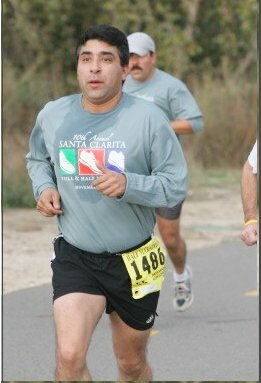 Antonio Arevalo, the 50 year old wonder from San Fernando came in at 1:52. However his time should have been more in the 1:25 but he got wrong instructions and took a wrong turn at a very confusing race junction. Diego Nava who only trains once a week and improves each time he runs a half, came in at 1:55:06. Jose Luis Aguilar, looking behind to see where Gilbert Varela (did not finish) was behind him and who just recently recover from an injury, came in at 1:59:28. Ramon "Apache" Cuevas finish with a 2:00:57 time. It is believed that Apache was directed to the wrong course at mile 12. 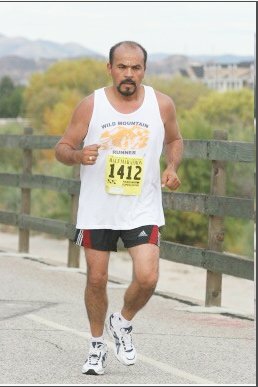 A few seconds after Apache comes Louie Martinez, oldest WMR participating on this day at 69, ran 2:00:59, 3rd in Division. Coming in like twins with exactly the same time of 2:03:48 was our veteran Gato, Ismael "Papo" Ortega and new Gato, Art Sanabria. 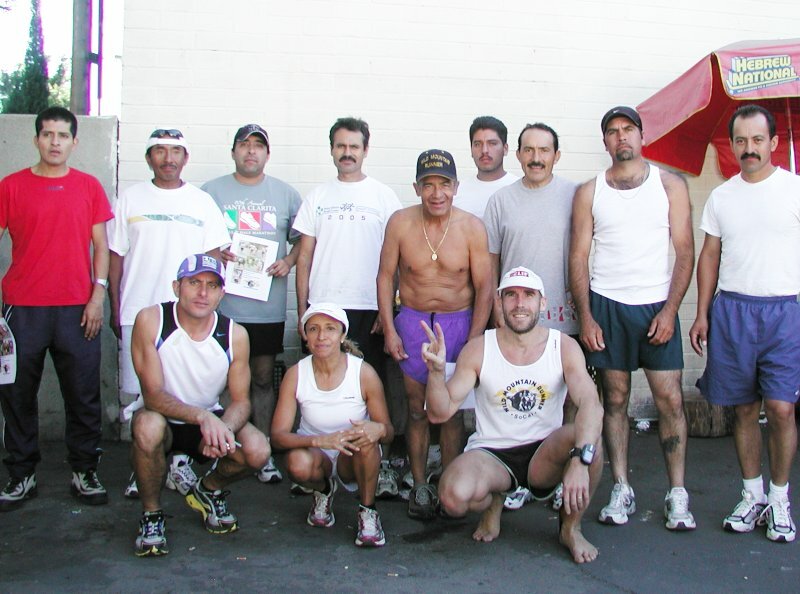 The marathon offered the Gatos a chance to show off not only their new uniform but also their running talents. Coming in 10 seconds behind second place was our very talented and focused Jaime Ortiz. 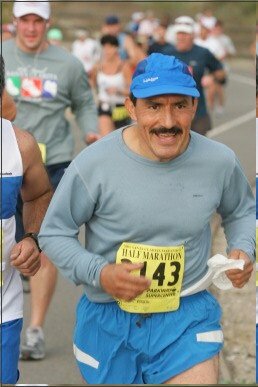 Jaime, like Julio Jaramillo, just ran the Long Beach marathon and came back to challenge the 26.2 mile distance one again. No one expected Jaime to better his Long Beach time but surprise - Jaime at 44 years of age and former winner of this marathon, finished with a spectacular time of 2:48:41! 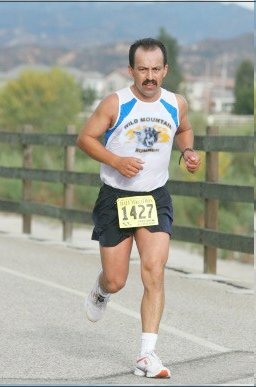 Representing the SF Gatos and wishing to do well before a home crowd, Abel Ibarra who at age 52 finished fifth with a grand time of 3:18:42. But read this! 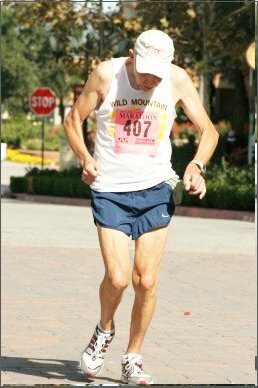 At age 65 our club founder Freddie Perez finished first in his division with a spectacular and fabulously blazing time of 3:26 42. How many runners half his age would dream of such a time? Then came Edwin Palencia at 3:32:27. 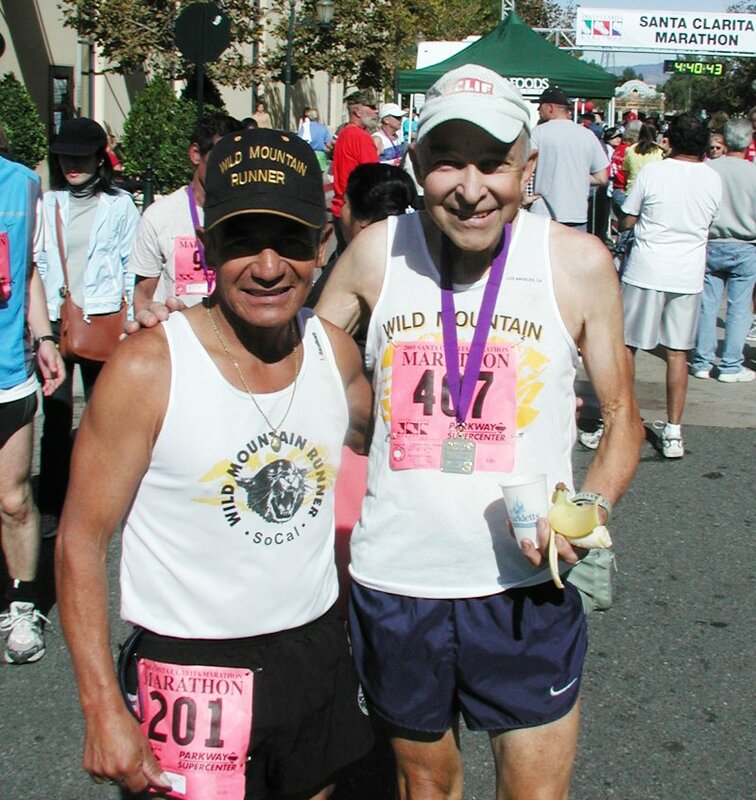 Then there is our grand old master Ray Prizgitas who at age 68 travels all over the globe to run a marathon. Ray finished 4th out of a field of 180 in his division with a time of 4:36:54. The women Gatas would not be outdone by their male counterpart. 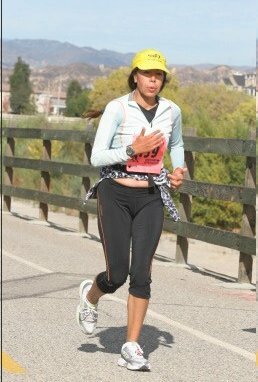 At age 50 and coming in first in her division, Berith Velasquez finished with a time of 3:48:58. She was 88th overall! 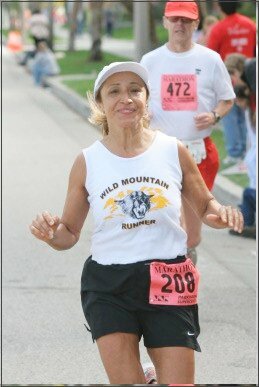 Patti Kahn at 47 finished 10th in her division with a time of 4:49:39. Congratulations Berith and Patti! 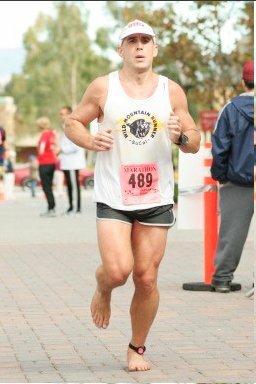 The San Diego half marathon is always an exciting race. 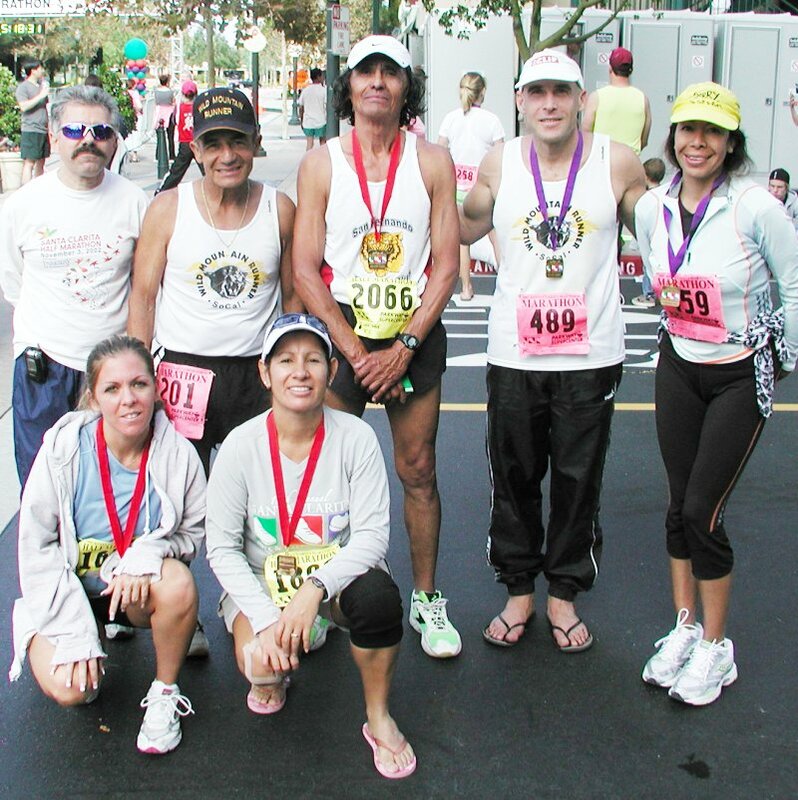 Although the prize money is limited, enough elite runners always show up to make the race one of the most popular half marathons in California. Last year only of our runners was in the top ten. Phil Apodaca came in all the way from New Mexico and surprised everyone with a fifth place showing. This year was more surprising as three of our Gatos placed in the top ten. Fredson Mayiek placed third, running an amazing 1:05:07 only thirteen seconds behind the leader Jose Luis Chuela of Mexico. What surprised everyone was that Fredson has been injured and had trained very little. He said that he went to San Diego expecting to place with the first twenty runners. Fredson should be congratulated for his admirable race. Oh yes, he took home $5000 in prize money. 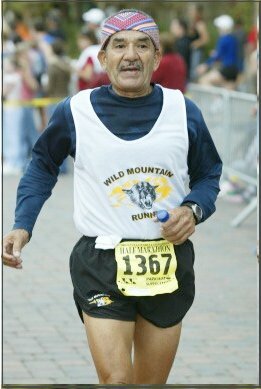 Second for the Wild Mountain boys was the ever determined Benito Cruz. Benito started with the front pack and with his relaxed running style he stayed with the leaders and place fifth overall. Benito took in $200 with a personal best 1:05:31. 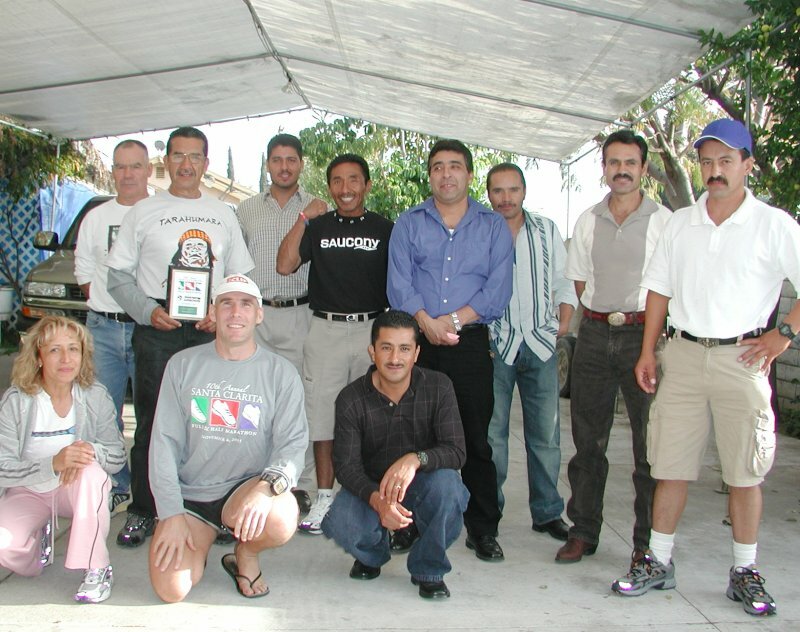 He was warmly congratulated by all the Gatos as he not only ran a spectacular race, but he succeeded in lowering his 1989 time. 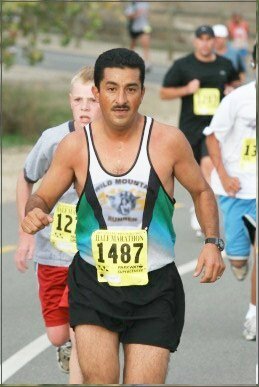 Wild Mountain Runner Danny Bustos flew in from New Mexico and apparently forgot to land! He flew to the finish placing ninth overall. Danny did not get paid for his fine running but did get a plaque and the satisfaction that he ran a good race. Danny stated that he felt that he could have run a better race if only he had spent more time developing speed. Alfredo Vallejo who had ran well the previous three races had to abandon the race because of abdominal pains. Alfredo, in his characteristically good nature way only smiled and is looking forward to the next available race. Freddie Perez remembers San Fernando when there were more orange groves than cars and his father drove a tractor next to a place that raised thorough bred horses. "I still remember some of the horses' names. There was one called Cholo and another called Sundance. We where surrounded by trees and I would often gather wood for outside cooking." From age two to the age of 9, Freddie's home was a hayloft and a saddle room. The eldest of three bothers and a sister, Freddie had to bear the most responsibility of meeting the every day chores that come with country living. But Freddie was restless and active. He remembers being tied down to a tree because "I was too travieso". Conflicting with his competitive and energetic spirit, his parents prohibited him in engaging in after school sports. "There was little league and other things but I had to go home" said Freddie. "Sometimes I would lie to my mother that I got in trouble and had to stay after school just to so I could play sports. I would get a whipping but I got to play!" laughed Freddie. By middle school he was showing his interest in running. He won several ribbons in the 50 and 100 yard dash. A coach once wrote in Freddie's year book "The way you run the bases, I'll be looking for your name in the record books." High school sports interested him a lot but he was too short for basketball and too small for football. But this didn't mean that he wasn't tough. "I don't know what I said to upsetthis huge football center but he came after me. I beat him up and gave him a black eye. After this the football coach wanted to recruit me" said Freddie. By the 10th grade he decided to joincross country and his interest in running soared. He was not the front runner but he managed to train hard enough to become their fourth man. In 1956 they won the regional cross country championships. Looking back to the 1954, Freddie still remembers watching Roger Bannister break the 4 minute barrier in the mile. This event had a lasting effect on Freddie, inspiring him to continueto improve his running. 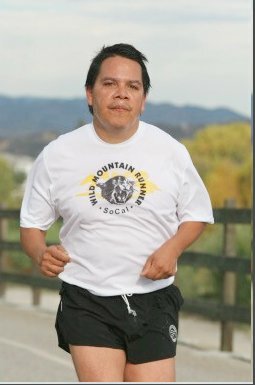 After high school Freddie trained only part of the year in anticipation of the San Fernando Mission Run. "Then I started to pick up race applications and started to run more often.But in those days if you ran the streets some people would holler at you and some would try to run you over!" exclaimed Freddie. That is when Freddie decided to run the hills and mountains surrounding San Fernando. "But as much as I ran, I could not break 40 minutes in the 10k. Then I started to do farklet style training and my times improved", said Freddie. Another event that inspired Freddie was watching Frank Shorter win the 1974 Olympic marathon. 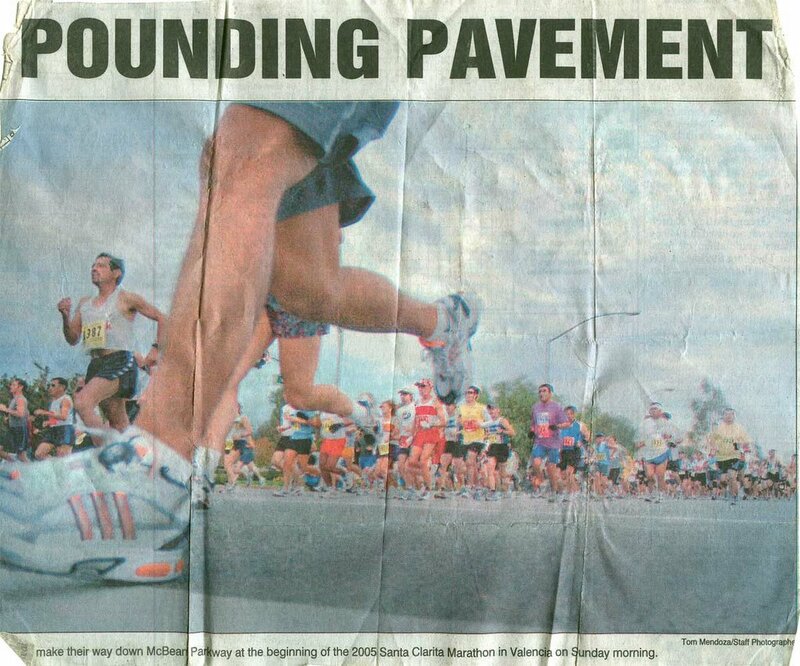 "By winning the marathon, Frank Shorter started the running craze and running became more popular in the United States." By 1976 Freddie got together with his compadre Pedro Ponce, his cousin Pepe Perez and Nacho Fonseca. 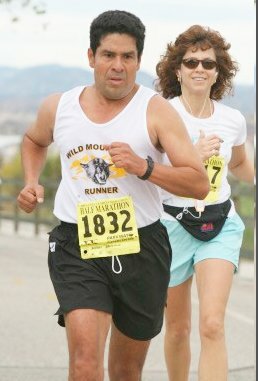 He was soon was running 30 mile runs at Mt. Wilson on Saturdays to train for the Western States 100. 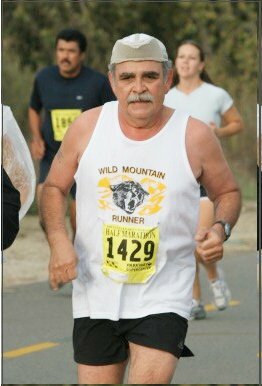 He would occasionally run with Jim Pellon who came in 2nd place 5 times. Freddie never ran the 100 mile run but his training made him stronger. 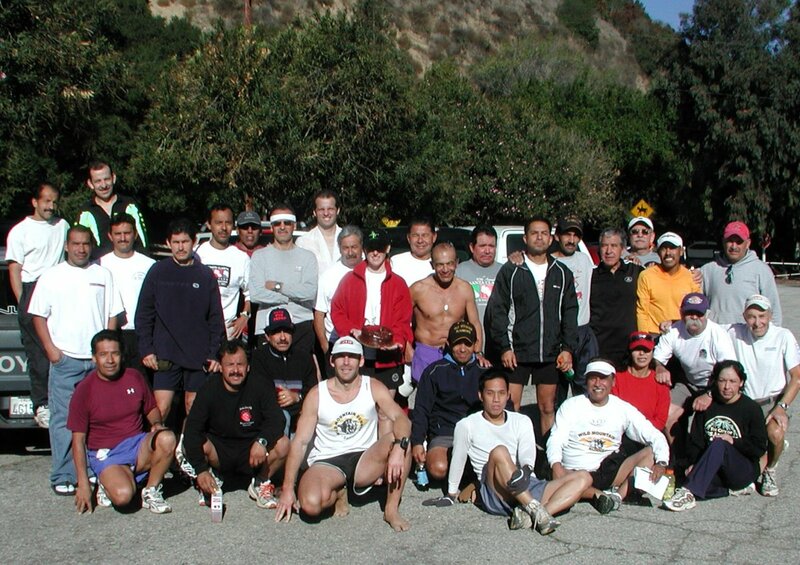 He later joined a group of runners who worked for General Motors in Van Nuys. Because Freddie did not work for General Motors, he was denied a uniform. Freddie decided to organize what would become the Wild Mountain Runners. When asked how he came up with the club name, Freddie recalls running Condor Peak and Little Tujunga trials. 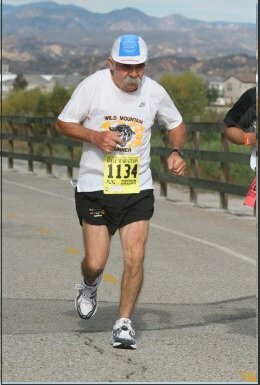 As he ran by the Wild Life Way Station, he could hear the roar of the mountain lions. But one day remains prominent in his mind. "As I was running this trail, my foot prints all of a sudden came upon the prints of a mountain lion. Our path met and the lion's prints followed mine until his paw prints disappeared into the brush." His contact with the mountain lion inspired Freddie to come up with the club name. As the club has grown, so has Freddie's running talents. 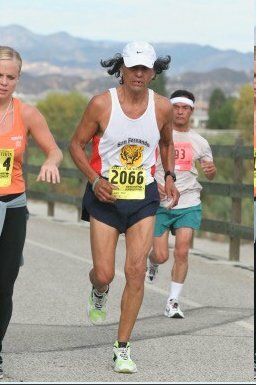 At 65 year of age, his running abilities seem to improve with age. 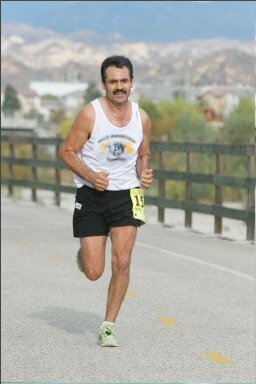 At the 2005 Santa Clarita Marathon, Freddie ran an amazing 3:26! 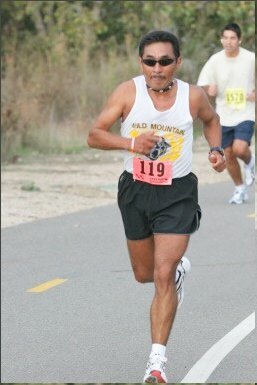 His best marathon was in 1983 when he ran 2:46:53 at the Bakersfield Marathon. 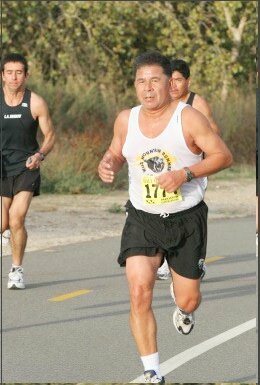 He has run every Los Angeles Marathon and is a member of the prestigious Legacy Runners. 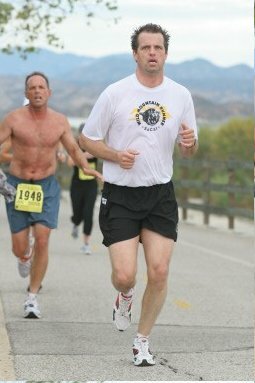 His best LA Marathon time is 2:55. 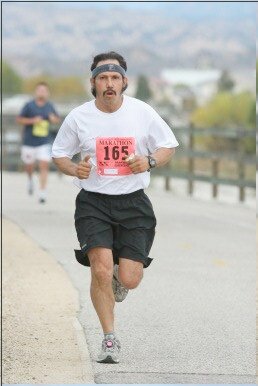 Freddie likes to quote a famous runner who said "Running changes a person and a marathon changes your life." How true this is. 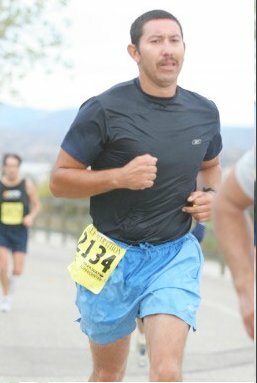 Freddie remembers many of his races but his most memorable run was the 1988 Lake Isabella 38.6 ultra marathon which he won in 5:06. The Lake Isabella captures the essence and spirit of Freddie's personality. He challenged a very grueling run with the intent of winning it. Each time he would come up short but he never gave up. He kept trying. He quotes Carlos Lopez of Portugal who won the 1984 Olympic Marathon who said "The more you run, the better you run". Indeed, this is what Freddie is all about. Never give up and keep trying. Freddie lives in Sylmar, California and is happily married to his lovely wife Arcelia. 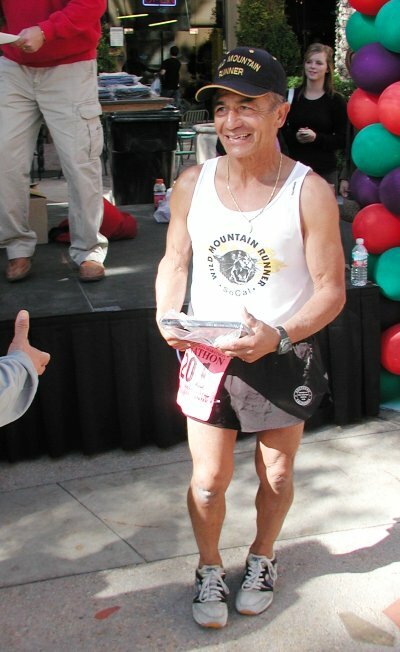 He has three adult children and hopes to someday have grandchildren who may someday be Wild Mountain Runners. He envisions the Wild Mountain Runner club as a club that can inspire young runners because as Freddie likes to say "Running changes your life". Antonio made it to the Daily News! Barefoot Ted Qualifies for Boston!